The 2017 2 Machs Motorcycles, Cheshire, Oset Cup championship got off to a very wet start on Sunday March 5th. 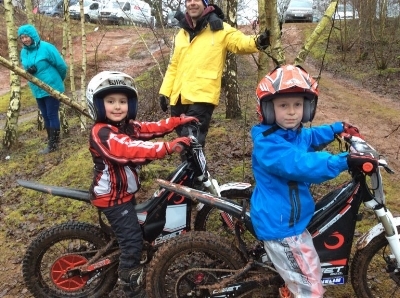 49 riders braved torrential rain and very muddy conditions in Mouldsworth Sand quarry to ride in the all-electric youth trials event. Oset bikes dominated the trial, with riders from the age of four taking part. William Sagar returned to the series to stamp his dominance on it from the off. An exceptional ride saw him losing just 12 marks all day to win the Expert class. Section four saw some muddy tight turns and rocks taking the majority of the days losses. Summer Brooksbank followed with a 23 mark loss, matching Will for the most-part of the day, just dropping her extra marks on the bumpy turn of section 3. Dylan Ratcliffe completed the podium getting used to his new Oset 24 finishing three marks further back on 26. Ellis Barton, last seasons youth D intermediate champion, adapted very well to the expert class narrowly missing the podium on just 27 marks. Series regular Ethan Richardson rode well to finish one mark further back on 28. The expert class saw it’s biggest and, arguably, most competitive entry ever. C class intermediate appears to be another growing class with a large entry being won by Aidan Williams on 13 marks, again section four added the most to Aidan’s score. Considering the conditions, a sub-twenty loss was something to be proud of though. Dan Douglas followed on just 18 marks, well done Dan. Ewan White had a storming ride, showing great improvement losing 24 marks to complete the podium. Joe Powell followed on 29, finishing with no rear brake as the wet sand of the quarry took it’s toll on his (and many other) set of brake pads! C class novice winner James Wyatt completed the course on 58 marks. Joe Stubbings aced the Intermediate route overall on an excellent 11 mark loss to win the D class inters. Owen Good showed that stepping up to the larger Oset 24 had been a great move, finishing his first trial in the inters with an excellent 2nd place. Another rider stepping up from the Novices this year and instantly impressing was young Charlie Skehan, taking the final podium spot on 33 marks, well done Charlie! Fourth place was decided on most cleans with Molly Barber taking the position from Kai Fairhurst both finishing on 42 marks. Series regulars Leo Clough and Ted Mackman followed on 43 marks with Leo in sixth place on a larger number of cleans. All action Isaac Tilson had a good ride on the smaller wheeled Oset 16 racing speeding his way to an eighth place with Wes Anderson having a great first outing on his Oset 24 losing 47 marks in ninth. As series organiser/one of the section setters (there’s two of us!!) I can only apologise to the Novices! On watching back the video footage after the finish it would appear that sections one and two resembled a scene from the Somme after the first few riders had been through. The small wheel bikes being virtually up their wheel spindles in mud! That said though the D class Novices was won on just 24 marks by Connor Thompson closely followed by Dominic Crossley on 28. Sections one and two taking most of the marks from both riders. Matthew Cowx finished in third on 46 marks. Logan Price took his first win of the year on 68 marks in Youth E. A closely fought class with both Jody Dawson and Ioan Lloyd only a few marks adrift in second and third place. Mason Dean looked to be enjoying himself in his first ever trial, wheel-spinning his Oset 12.5 into 4th place and grinning from ear-to-ear all day! Great to see!! Overall a successful event with plenty of fun being had in the mud and all of the riders not appearing to notice the falling rain. The next event is set for April 9th at the Alvanley trials ground, sunshine is booked, it’s guaranteed not to rain in April! All that remains is to thank the observers for taking their time to mark the scorecards. The winner of the £50 cash in the observers raffle was Gemma on section two. Thanks also to Matt Barber for helping to set the course on the Saturday, then change most of it on Sunday morning!! Please follow the links below for a video (complete with a bang up-to-date soundtrack with Journey, Alex Party and Simple minds! ), full results and championship table.